While looking for races around Nashville, the immediate one was on the 22nd Nov 2009. But the name of the race lured me to register. 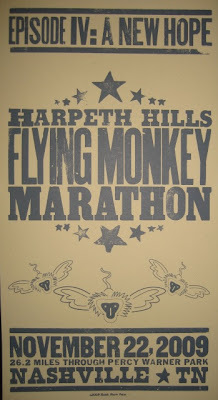 Flying Monkey Marathon. The pictures of the race course through Percy Warner Park was so pretty but then I was so upset when I noticed that the deadline for registration was already over. I wanted to give it a shot though, so I contacted the RD Trent, one of the funniest guys I have ever met, asking if he can accommodate an Indian Flying Monkey in the race and was just waiting…..
October 18, there was a mail sitting in my inbox saying that I can register for the race, w00t! I was so glad looking at the email and registered for the race right away. I used to hang out in Monkey Chatter reading all the funny emails especially the ones sent by Trent. Hilarious! I used to have my rofl moments reading his email. My first marathon in the US and I am glad it’s going to one cool marathon race. Harpeth hills!! Here comes the flying Indian monkey!